A series of hearings this week will gather public opinions on a proposed pipeline that would increase the amount of oil flowing across Minnesota by 225,000 barrels a day. The line is called Sandpiper, and the crude it would carry from North Dakota's Bakken oil fields would be a significant addition to the more than 2 million barrels of oil that daily travel through underground pipelines bound for refineries in the Twin Cities and beyond. Trains carry an additional half-million barrels. But the plan has raised concerns among environmentalists and state agencies about potential risks to lakes and rivers. A project manager for Enbridge, the Canadian company that wants to build the line, said the project is necessary "because there's a growing supply of crude oil in western North Dakota, and it needs efficient, cost-effective and safe transportation to get to the markets in the Midwest and the East in the U.S. where it's needed." Bill Blazar, interim president of the Minnesota Chamber of Commerce, voiced strong support, saying calling the project "key to the development and growth of our state's economy." "We'd be nuts not to support this kind of infrastructure development," Blazar said. Sandpiper would zigzag about 300 miles across the state. Roughly three-quarters of the path would follow existing utility corridors — to Enbridge's terminal in Clearbrook, in northwest Minnesota, and then south to Park Rapids before turning east to the company's hub in Superior, Wis. Opponents say that route runs too close to sensitive lakes and rivers, wetlands and wild rice habitat. Richard Smith heads up the group Friends of the Headwaters, which wants to keep Sandpiper away from the headwaters of the Mississippi River. "We're not against the company building the pipeline," Smith said. "We just think the company should consider a different place for this pipeline so that Minnesota's water resources aren't at risk." That view is shared by the Minnesota Pollution Control Agency and Department of Natural Resources. Both agencies asked the Public Utilities Commission to consider alternate routes that would skirt northern Minnesota's lakes region. In a letter to the utilities commission, the MPCA wrote that the proposed route for Sandpiper would cross 28 water bodies where there is no nearby access in case of a possible spill. The DNR wrote that the proposed route crosses "a region of the state that contains a concentration of important lakes for fisheries, trout streams, sensitive aquifers, public conservation lands, and mineral and forestry resources." Last September, in a step unprecedented in the state, the utilities commission ordered a closer look at six different route options. It was the first time the commission had asked a pipeline company to consider a route completely different from what it had proposed. The Commerce Department then took a broad look at the environmental impacts of those options. The department's analysis determined that Enbridge's preferred route crossed more wetlands and forested areas. But it also crossed the fewest number of streams and avoided more cities and towns. Friends of the Headwaters welcomed the decision to analyze alternate routes, but filed suit asking for a full-blown environmental impact study of the pipeline plan. The group contended that the Commerce Department's environmental analysis of the alternate routes was inadequate and rushed. Smith said he thinks "Minnesotans deserve the right to take enough time to do a full analysis for where they want to put this pipeline." Smith and others say the decision is especially critical because there will likely be more than just one pipeline. Enbridge has already announced plans to replace a different line with a new pipe in the Sandpiper corridor. Craig Sterle, a retired DNR forester and member of the group Carlton County Land Stewards, says he expects it won't end there. "We believe that eventually, with all the exploration and pumping that's being done in the Bakken, and up in Canada in the tar sands, there will be pressure for additional lines," he said. "So there will be a large new corridor cutting across Minnesota, and so we want to make sure it's done in the right place, and done the right way." Enbridge officials believe their preferred route is the right way. The company worked hard to avoid lakes in designing the pipeline route, said Project Director Paul Eberth. 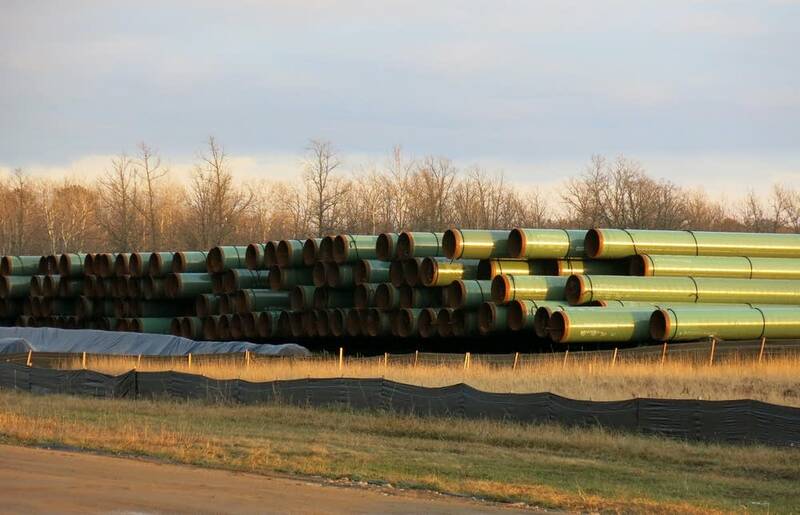 According to an analysis conducted for the company by Barr Engineering, "only about 3 percent of the lakes in the watersheds that we cross have a hydrological connection to the pipeline," he said. Enbridge has negotiated easements with 92 percent of landowners along the route. Eberth said many of the alternate routes that veer west and south of the state's northern lakes country would cost more, and would potentially affect more cities and streams. "There's more people that live along that route," he said. "There's also water features that would be crossed — streams, creeks, waterways. Generally, a lot of similar features that you see in northern Minnesota. The density is less, but the length is longer, which still provides for a potential to impact people." Eberth said the state's decision to analyze alternate routes has set back the pipeline's likely start of service to 2017. Dan Olson, with the International Laborers Union in Superior, said his members are eager to get to work on the project, which is expected to create 1,500 construction jobs. "I've got a good workforce that has worked on the pipelines," he said. "They're anxious to get going — but hopeful that it will go through the right process so it's done right." That process continues at 2 p.m. today with a public hearing in St. Paul. Other meetings follow this week in Duluth, Bemidji, Crookston and St. Cloud.